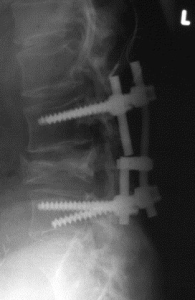 Should you have your hardware removed after spine surgery? One question that patients who have had spine surgery often ask their Las Vegas Pain Management Doctors is whether or not they should go back to the surgeon for hardware removal. This is especially true when patients have residual pain after surgery. Notice the broken hardware. This often indicates failure of fusion and need for another surgery. 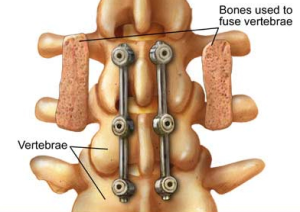 When a spine surgery is done as a fusion, instrumentation is placed to help hold the bones together while the fusion occurs. For a few months, fusion will slowly take place and the hardware is instrumental in keeping things stable during that process. If the fusion occurs, the hardware is then not really doing anything. However, if the fusion fails, and the hardware is continuing to take a lot of stress it may eventually break. It is very common after spine surgery for residual pain to continue. Unfortunately, it is the rare back surgery that eliminates 100% of a patient’s pain. To evaluate for whether or not a hardware should be removed, x-rays and a CAT scan should be performed to see if the fusion took place. If the hardware is broken, and the patient is having a lot of pain, then it is reasonable to assume that there was a problem with the fusion and a surgeon should be consulted. However, if the fusion is solid and hardware is intact, then a soft tissue injection should be performed in the area directly around the hardware by a Pain Management Doctor in Las Vegas. This may provide some helpful information as to whether or not it is the hardware potentially irritating some of the soft tissues and causing a problem. If this does not help substantially, it is probably not the best idea to have the hardware taken out. If it does take away a lot of pain, then it may be a good idea to go ahead and have the hardware removed. Keep in mind that having hardware removed does entail another incision and having the surgeon go right back through the soft tissue from the first time. Granted, a small incision can be used but nevertheless, it will entaill another trip to the operating room. Another option is if the injection at a pain clinic in Las Vegas helps relieve pain around the surgical area, to see how long that pain relief lasts. It may be that a simple injection into this area every few months does the trick. Deciding on whether or not to undergo a hardware removal after spine surgery is not a simple decision. With a proper workup, logical decision can be made for the decision with your Las Vegas Pain Doctor. The Nevada Pain Network connects those in pain with the best pain providers in the Las Vegas and Henderson areas. For pain management Las Vegas trusts, simply fill out the form on the page or call (702) 323-0553 today!